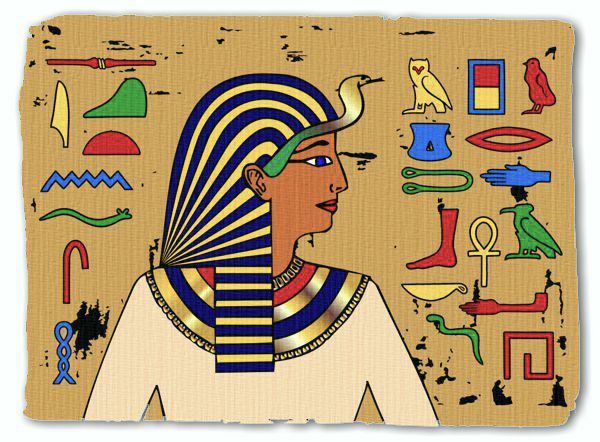 In Ancient Egypt, there were many different crowns and headdresses that were worn by the Pharaohs and the Gods. They reflected the authority and status of the wearer and often had special religious or symbolic meaning. The Atef Crown was worn during religious rituals. It is basically a white crown which is trimmed with ostrich feathers and has a gold disk at the top. 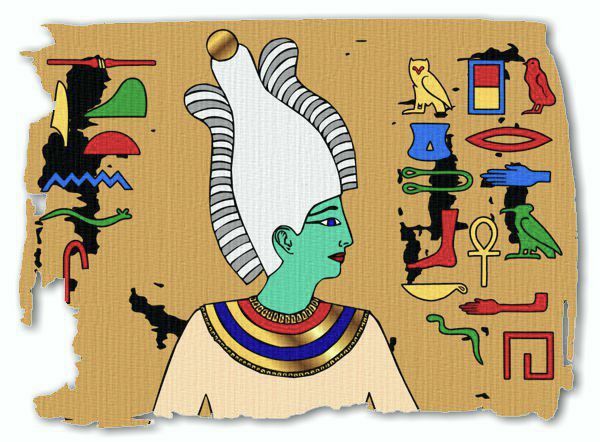 It is worn here by Osiris who was the god of vegetation and agriculture, which is why he is portrayed with green skin. Osiris was murdered by his brother Seth, who cut his body into pieces and scattered them throughout the land. After a long search for the parts, he was reassembled by Isis, his devoted wife, who breathed new life into him. As Osiris had triumphed over death he became the king and judge of the underworld. The Pharaohs believed that they would become an Osiris when they died. To them and all his worshipers, he represented the cycle of life, death and rebirth. 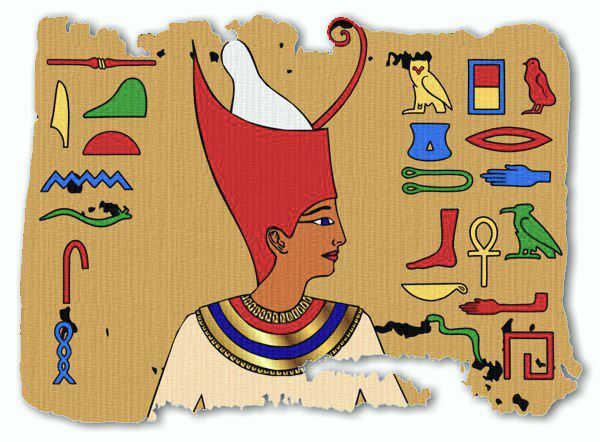 The White Crown of Upper Egypt is also known as the Hedjet Crown. It looks a bit like a bishop's mitre and was probably made from cloth or felt. 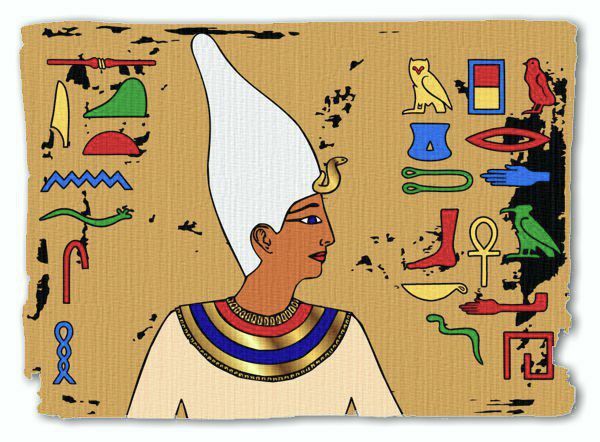 The White crown was worn by the rulers of Upper Egypt before the unification with Lower Egypt. Like the Royal Vulture Crown, it had a special association with the goddess Nekhbet. Horus, the falcon god, was usually shown wearing the White Crown. The Red Crown of Lower Egypt has a distinctive high crest at the back with a long rigid line that angles upwards towards the front. Sometimes this line is curled at the end. It is also known as the Deshret Crown. 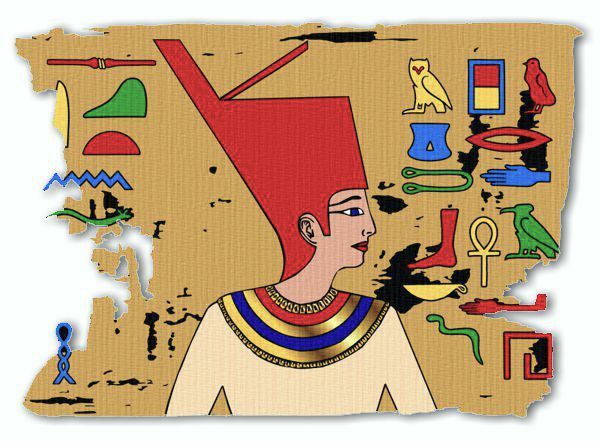 The Red Crown was the emblem of the goddess Neith, who was the patron of the city of Sais in Lower Egypt. The terms Upper and Lower Egypt are confusing as they conflict with the way that we read maps today. Lower Egypt is in the north of the country around Cairo and Giza, while Upper Egypt is in the south around Luxor and Thebes. The Double Crown of Upper and Lower Egypt is also known as the Pschent Crown or 'sekhemti' which meant the 'Two Powerful Ones'. 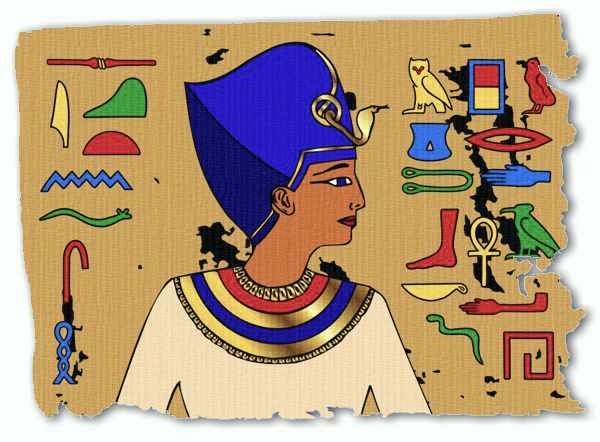 It was a combination of the Red Crown of Lower Egypt and the White Crown of Upper Egypt. King Menes of Memphis founded the First Egyptian Dynasty around 3100 BC and unified the Two Lands of Upper and Lower Egypt. A dynasty is the reign of a series of kings who all belonged to the same family. There were 30 dynasties who ruled Ancient Egypt. The Blue Crown was also known as the 'war crown' or the Khepresh Crown. It was probably made from cloth or leather, then painted blue. Sometimes it was decorated with golden discs and a twisting royal uraeus usually adorned the front. It is a military helmet and is often worn during battles and hunting. Ramesses II was depicted wearing this crown in a famous painting to celebrate his victory over the Hittites. The Royal Uraeus Crown is also referred to as the Sacred Serpent Crown. The Uraeus on the front is a symbol of the Goddess Wadjet who was depicted in the form of a rearing cobra. The head of a typical Egyptian figure is seen from the side, but the eye and body are seen from the front. Figures are usually shown wearing a traditional crown or headdress (nemes) and a pectoral decoration (menit) across the shoulders and chest. 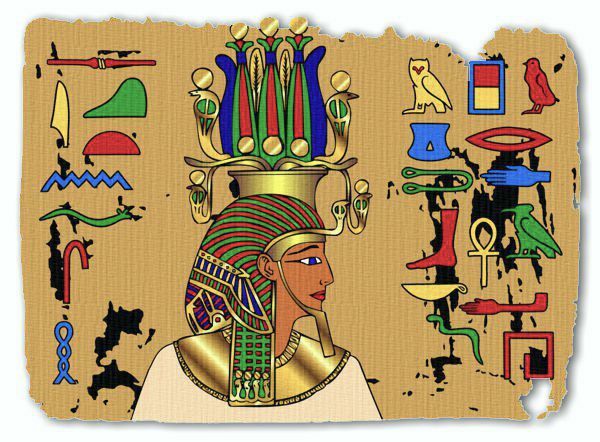 The Egyptian Pharaohs wore different crowns for different occasions and to show their loyalty to certain gods associated with a crown. The Royal Vulture Crown offers protection from the goddess Nekhbet. 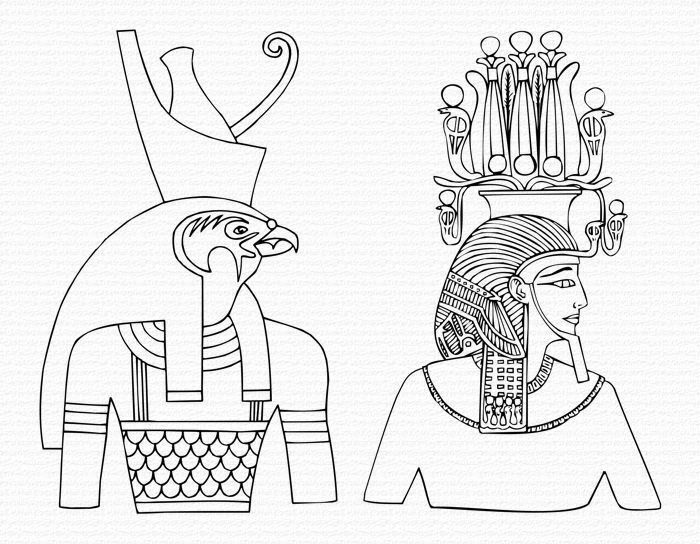 Nekhbet is frequently represented as a large vulture, flying above the head of the pharaoh. Her wings are usually spread open in a protective gesture, guarding him from his enemies. 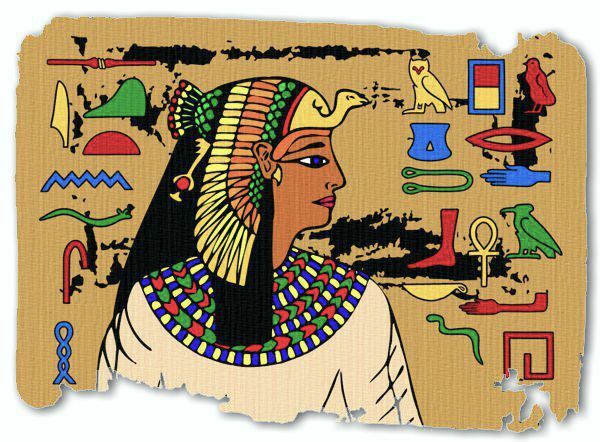 Nekhbet is normally associated with the protection of Upper Egypt and she is often portrayed wearing the White Crown of Upper Egypt. She was also known as the goddess of childbirth, mothers and children. The Hemhem Crown is a very elaborate form of the Atef crown, sometimes known as the Triple Atef Crown. It originated during the 18th dynasty was first seen in an image of the pharaoh Akhenaten in a tomb at Amarna. It is worn here by Ramesses II. There is another example of this crown worn by the young Tutankhamen on the back of the gilded throne that was discovered in his tomb. This decorative crown was certainly designed to demonstrate the power of the Pharaoh and was worn for very important ceremonies. 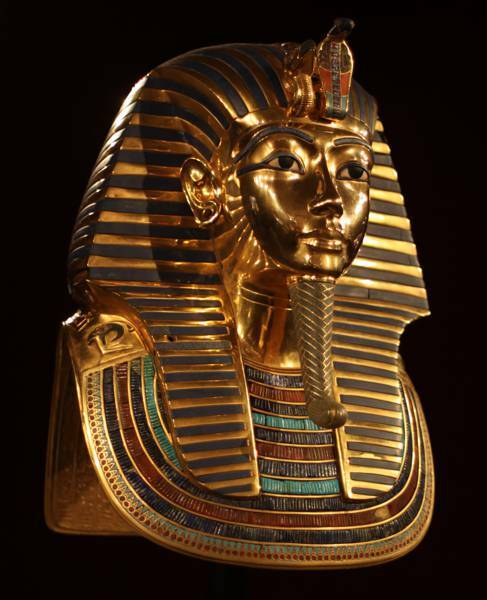 Replica of Tutankhamon's mask from the exhibition in Madrid.